In the New Apostolic Reformation (NAR) Movement, there is a strong emphasis on identifying, submitting to, and naming individuals your spiritual father (mother). How does this stand up in the light of Matthew 23:9? Protestants cavalierly dismiss this admonition as having no personal application. The Roman priesthood is too big a target for Protestant arrows to miss. Unfortunately, the Roman speck obscures the Protestant log. The emphasis on honoring leadership[i] and using honor titles[ii] in apostolic circles does not take second fiddle to any Roman practice. In spirit, it is not an iota different than any Roman custom, and in practice the level of veneration and honor ascribed to spiritual fathers in the apostolic movement would make a cardinal turn redder than his cape with embarrassment. 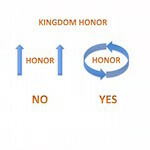 The rationale used for honor titles is “it teaches the people honor and respect.” Maybe, maybe not. There is nothing wrong with giving honor to whom honor is due as long as it is in a community of mutuality, where the least honorable are given the greater honor! [iii] We are to honor every one,[iv] not just the pastor of the church or the apostle of the network. In thirty years of church experience in various local church environments and diverse theological backgrounds, I received copious teaching on 1 Timothy 5:17 (giving double honor to leaders: e.g. pastors, apostles, etc.). Yet, at the same time, I have never heard a single practical message preached on 1 Corinthians 12:23-25 (honoring the least honorable), nor seen regular policies and protocols of honor implemented to emphasize those verses with the same sense of conviction with which honor of leaders is preached. I would like to put out a simple challenge to the church leader who might be irritated with me while reading this: Who gets the best seating in your church? Who gets the best parking space? Who gets special days of appreciation in their honor? Who has the finest office? Who has access to the VIP snack room after service? The dear saint who quietly takes care of his/her invalid mother everyday without fanfare? Or the glow-in-the dark apostle/bishop who is in for a weekend’s worth of meetings? Uh, Houston . . . we have a problem. When honor flows in one direction—upstream—to hierarchy, position, ministry, office, and rank, we are ungodly ground, even with 1 Timothy 5:17 hanging on our lips. We are called to honor everyone: all human beings, because we all bear the image of God (this includes unbelievers), the least honorable, the elders who serve well, and one another in the family of God as fellow heirs, and so on. The Matthew 23:8-12 passage is clearly a divine ban. The King James Version ye in verse 8 is emphatic. [v] In modern street English, it could be rendered: “Listen up, I am talking to you . . . this means you!” The implication of these verses goes beyond a generic ban on using inflated titles of honor, or false prestige, though these are undoubtedly included. Jesus specifically mentions three distinct classes, or categories, in His ban: Rabbi, father, and master. Why would the Lord mention these three? What would these titles or terms have in common, beyond being generally honorific, that the Lord would so group them? We need to understand some cultural background to get to the bottom of the matter. A full examination of the role of the rabbis in first-century Judaism is beyond the scope of this writing. However, one element has bearing on this topic. The rabbis believed that, as teachers of Torah to the people, they were the guides into, or the brokers of, eternal life to Israel. [vi] They believed they had power, through their teaching of the Torah, to give or withhold access to eternity. Christ refers to this in verse 13 when He describes the Pharisees and scribes “shutting up heaven” to their followers. Abba[vii] (father) was also a term applied to and desired by the rabbis. In their culture, leading or guiding someone made you metaphorically their master; hence, Jesus uses the term almost synonymously with rabbi. Naturally speaking, a father is someone without whom you would not have literal, physical existence. A father is responsible (with obvious partnering help! ), not for bringing life to you, but in a sense, bringing you to life. He is the agent, or broker, of your physical existence. Without him (parents), you could not experience physical life. First-century Palestine was a patronage culture, not an individual merit culture. To advance in society, or at times to even have access to the essentials of life, it was necessary to develop relationship with a rich patron who could assure you of access to monetary resources, or favor. You could not categorically advance in their society through hard work and self-effort. That is a Western, primarily American, value (one of our better ones, though not without weaknesses!). This notion simply did not exist in their culture. You got ahead in life by honor status at birth or by the community granting you honor, not by your own personal merits. In exchange for a patron’s favor, the beneficiary was responsible to extol the patron’s virtues in the community. The recipient of the patron’s favor would often walk behind the patron in public, vocally expressing how wonderful the patron was. [viii] Without a sponsoring patron (who would in effect be one’s master), the basics of life sustenance often were not accessible. The patron/master was literally responsible for life or death. In a kingdom context, there is only One life-brokering Lord, and it is not a covering apostle! We are all equal brethren before the only true Life-broker and Grantor of favor. The only broker of life and blessing to the believer is Christ Himself, not covering spiritual fathers or apostles. We can all receive blessing from one another, through the diverse giftings and ministries distributed in the Body. However, limiting the power to bless to a vested individual in a certain office, or viewing spiritual fathering in a covering and life-brokering capacity is error. Copyright 2016, Dr. Stephen R. Crosby, www.stevecrosby.org Permission is granted to copy, forward, or distribute this article for non-commercial use only, as long as this copyright byline, in totality, is maintained in all duplications, copies, and link references. For reprint permission for any commercial use, in any form of media, please contact stephrcrosby@gmail.com. [i] There is no issue with honoring our leaders. The problem is one of degree and balance. 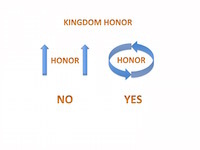 If honor flows only to leadership ministries and “spiritual fathers” rather than honor flowing one to another in the community in the spirit of mutuality, the legitimate principle of honor becomes corrupted. [iii] 1 Corinthians 12:23-24. The Scriptures are clear. Honor is not to be bestowed upon rank; they don’t need it. Honor is to be bestowed upon those who “lack” and whom we would consider the least honorable. The apostolic movement is dishonorable in its policies of honor! [v] Exell, Joseph and Spence H.D.M, eds. The Pulpit Commentary: McClean: Macdonald Publishing, n.d., p. 397. [vi] Albert Barnes Commentary on Matthew 23. [vii] Keener, Craig. IVP Bible Background Commentary of the New Testament, 1993; Electronic Edition STEP files. 1999. Parsons Technology. [viii] Refer to Malina, Bruce. J. and Rohrbaugh, Richard L. Social Science Commentary on the Synoptic Gospels. Minneapolis: Fortress, 1992. Good article, Spiritual Fathers, Stop the Insanity. Bless you Steve and Rita. How does one get to Stop the Insanity, part 1?